Background: Active management of infertility involves the reduction of the diagnostic workup time for infertility. However, the timing of decision for assisted conception by the couple and medical personnel is often challenging. FertilScore was developed to simplify this decision timing and make the process more objective. Materials and Methods: A scoring tool was developed using the Delphi method. This involved 3 experts in assisted conception assigning scores to a list of the etiological factors for infertility. The tool was administered to 35 couples presenting to a gynecology clinic and 15 couples who completed the tool on that hospital's website. Grading for couple's need for in vitro fertilization (IVF) was low (1–9), moderate (10–14), and high (15–96). The information obtained has been analyzed. Results: Twenty-four (48%) couples had low need for IVF, 17 (34%) moderate need, and 9 (18%) high need. Seventeen were true positive and 9 false positive. There was no false negative and 24 were true negatives. The sensitivity of the tool was 100%, specificity 72.7%, positive predictive value 65.4%, negative predictive value 100%, and accuracy 82%. Conclusion: FertilScore is sensitive at identifying infertile couples that would require IVF and should help in reducing the time and resources deployed to evaluation. The tool would need to be validated in a larger multicenter population. Keywords: Active management; FertilScore; infertility; scoring tool. Infertility is an important public health challenge in Nigeria as in other parts of the world., The etiology ranges from simple to complex factors, as well as male and female factors., The challenges of the infertile couple are usually multiple, including social, medical, and financial issues. There is also the possibility of the couple having to consult multiple medical personnel to solve their fertility problem., Sometimes, the couple are subjected to repeated investigations by the same or multiple medical personnel, instead of being referred for assisted reproductive technology (ART) or in vitro fertilization (IVF). This contributes stress, financial strain as well as social isolation., ART has emerged as a veritable tool in the management options for infertility. Questions such as what therapy and timing of application of the therapy need to be addressed for appropriate management. Timely intervention is crucial to success and is the concept of active management of infertility. The objectives of the study are to develop a tool for individualized assessment of infertility by the couple as well as the attending medical personnel and apply the findings to guide the need or otherwise to seek IVF services. A questionnaire was developed as the scoring tool and graded by three experts in the field of IVF. The parameters were made up of causative factors of infertility. The Delphi method for medical risk scoring was used to obtain the scores for each fertility challenge. The tool was assessed and completed on the website of Nisa Hospital, Abuja, Nigeria by couples and at the gynecology clinic of the hospital by the attending doctor. Grading for couple's need for IVF was as follows: low (1–9), moderate (10–14), and high (15–96). The scoring tool is shown in [Table 1]. Overall, 50 couples completed the tool, 15 couple from the website and 35 at clinic. The completed tools' scores were each added up and placed in the three categories of low, moderate, and high need for IVF. After placing the FertilScore sheets in different categories for need of IVF, each sheet was scrutinized and discussed among two of the authors to identify true- and false-negative scores as well as true- and false-positive scores; these were used to calculate the overall risk prediction of the tool [Table 2]. The sensitivity was calculated using the formula A/A + C × 100, specificity D/D + B × 100, positive predictive value A/A + B ×100, negative predictive value D/D + C × 100, and accuracy A + D/Total × 100 (where A is true-positive need for IVF, B false-positive need for IVF, C false-negative need for IVF, and D true-negative need for IVF). Twenty-four (48%) couples had low score, 17 (34%) moderate score, and 9 (18%) high score. Seventeen scores were true positive and 9 false positive. None of the scores was false negative and 24 were true negatives [Table 2]. The sensitivity was 100% (17/17 + 0 × 100) and specificity 72.7% (24/24 + 9 × 100). The positive predictive value was 65.4% (17/17 + 9 × 100), negative predictive value 100% (24/24 + 0 × 100), and accuracy 82% (17 + 24/50 × 100). Active management of infertility is the evaluation of an infertile couple with a diagnosis and management plan within a period of 4–6 weeks. This concept is important as it reduces the time wasted between the first presentation to a doctor and referral for assisted conception if necessary. The evaluation of infertility can be expensive and may involve uncomfortable procedures. For instance, hysterosalpingography can be uncomfortable and repeating such investigations can be distressing, and the implications of repeated medications such as clomid , can be problematic. The diagnosis and management should go hand in hand with proper consultation between the primary physician and the assisted conception expert. Medical practice decision is aided by scoring tools. Bishop and APGAR scores are useful tools in Obstetrics and Neonatology., Factors which can be handled easily have a lower score than those which need special interventions. For instance, a woman with one blocked tube can still get pregnant without assistance as against one with bilateral tubal blockage, and a man who has azoospermia will need assisted conception unlike one with erectile dysfunction. The present FertilScore has a high sensitivity and specificity and should assist both the couple and the primary physician to know when to refer to or seek help at an IVF center. Although there are several protocols, diagnostic tools, and algorithms for evaluation and management of infertility,,, they are usually not helping in decision making regarding the timely need for IVF. The present FertilScore is helpful in this crucial decision-making process. Furthermore, the tool enables the couple to self-evaluate their need for IVF, so they can seek help at an appropriate center early. This would help prevent consultations and multiple visits to several medical personnel as well as opting for unorthodox treatment. The time and resources saved may well be significant. While the FertilScore is helpful in decision making on need for IVF, it does not obviate the need for thorough history and physical examination of the infertile couple at presentation. FertilScore is sensitive at identifying infertile couples that would require IVF and should help in reducing the time and resources deployed to evaluation. The tool would need to be validated in a larger multicenter population. 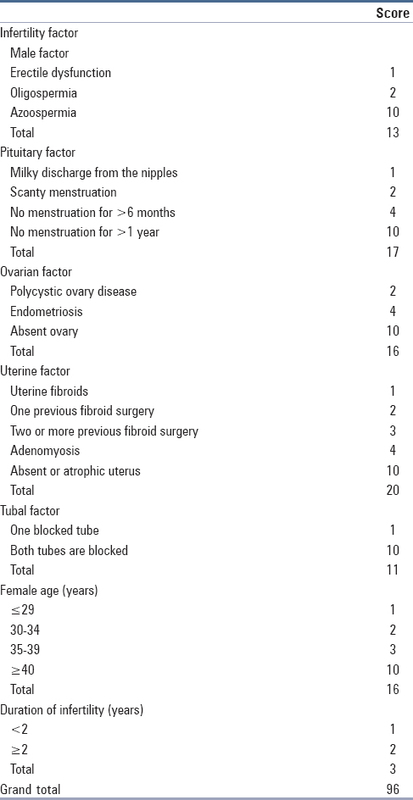 Deyhoul N, Mohamaddoost T, Hosseini M. Infertility – Related risk factors: A systemic review. Int J Womens Health Rev Sci 2017;5:24-9. Okonofua F. Traditional medicine and reproductive health in Africa. Afr J Reprod Health 2002;6:7-12. Brugo-Olmedo S, Chillik C, Kopelman S. Definition and causes of infertility. Reprod Biomed Online 2001;2:41-53. Ekwere PD, Archibong EI, Bassey EE, Ekabua JE, Ekanem EI, Feyi-Waboso P. Infertility among Nigerian couples as seen in Calabar. Port Harcourt Med J 2007;2:35-40. Orji EO, Ogunniyi SO. Sexual behaviour of infertile Nigerian women. J Obstet Gynaecol 2001;21:303-5. Akinloye O, Truter EJ. A review of management of infertility in Nigeria: Framing the ethics of a national health policy. Int J Womens Health 2011;3:265-75. Ikechebelu JI. Assisted reproduction technology (ART): The state of the art in Nigeria. J Coll Med 2003;8:1-6. Araoye MO. Epidemiology of infertility: Social problems of the infertile couples. West Afr J Med 2003;22:190-6. Lindsay TJ, Vitrikas KR. Evaluation and treatment of infertility. Am Fam Physician 2015;91:308-14. Abdalla HI. Active management of infertility. Br J Hosp Med 1992;48:28-33. Forti G, Krausz C. Clinical review 100: Evaluation and treatment of the infertile couple. J Clin Endocrinol Metab 1998;83:4177-88. Kamel RM. Management of the infertile couple: An evidence-based protocol. Reprod Biol Endocrinol 2010;8:21. Sandilands DD, Gotzmann A, Roy M, Zumbo BD, De Champlain A. Weighting checklist items and station components on a large-scale OSCE: Is it worth the effort? Med Teach 2014;36:585-90. Letko MD. Understanding the apgar score. J Obstet Gynecol Neonatal Nurs 1996;25:299-303. Elghorori MR, Hassan I, Dartey W, Abdel-Aziz E. A way to lend objectivity to bishop score. J Obstet Gynaecol 2006;26:311-6. Indrayan A, editor. Clinimetrics and evidence based medicine. In: Medical Biostatistics. 3rd ed. Boca Raton: Taylor & Francis Group; 2013. p. 305-19. Ayida G, Harris P, Kennedy S, Seif M, Barlow D, Chamberlain P, et al. Hysterosalpingo-contrast sonography (HyCoSy) using echovist-200 in the outpatient investigation of infertility patients. Br J Radiol 1996;69:910-3. Sulayman HU, Ameh N, Adesiyun AG, Avidime S, Bakari F, Muhammed A. Evaluation of the infertile male. Afr J Infertil Assist Concept 2016;1:27-34. Kakarla N, Bradshaw K. Evaluation and Management of the Infertile Couple. Global Library of Women's Medicine; 2008. Available from: http://www.glowm.com. [Last accessed on 2018 Oct 28]. The FIGO Fertility Tool 4. How to Diagnose Infertility. The Fertility Tool BoxTM. FIGO. Available from: http://www.fertilitytool.com/tools/basic-tools-4-diagnose-infertility/. [Last accessed on 2018 Oct 28]. Active management; FertilScore; infertility; scoring tool.